In our goal to maximize the value of all materials, we have found an important role for waste that cannot be recycled. Landfill gas (LFG) is a readily available, local and renewable energy source that is produced in the landfills as solid waste decomposes to produce Methane. Methane a potent greenhouse gas that can be captured and used to fuel power plants, manufacturing facilities, vehicles, homes, and more. 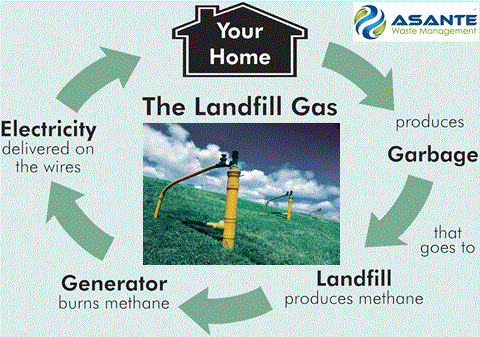 Through landfill gas plants, Asante Waste Management will create clean, green energy from ordinary waste. Our landfill-gas-to-energy projects will generate enough energy to power over 200,000 homes every day offsetting almost one million tons of coal per year. It’s a true win-win for both companies and communities where we will operate.